→Can Hashimoto’s Be Reversed, Treated or Cured? If you're newly diagnosed with Hashimoto's (or if you've had it for a long time) then I want to take a quick paragraph to explain what it is. Hashimoto's thyroiditis is considered an autoimmune disease of your thyroid gland. It means that if you have this disease that your body is creating antibodies (part of the immune system) that are cross-reacting with your thyroid gland and ultimately leading to its destruction. This process can occur on virtually any part of your body and depending on where it occurs changes the name of the disease. Auto destruction of your joints is known as rheumatoid arthritis (1). Auto destruction of your nerves is known as multiple sclerosis (2). Auto destruction of your adrenal glands is known as Addison's disease (3). Because these diseases are triggered by your immune system the treatment to halt the auto-destruction is to usually slow it down (or attempt to stop it). 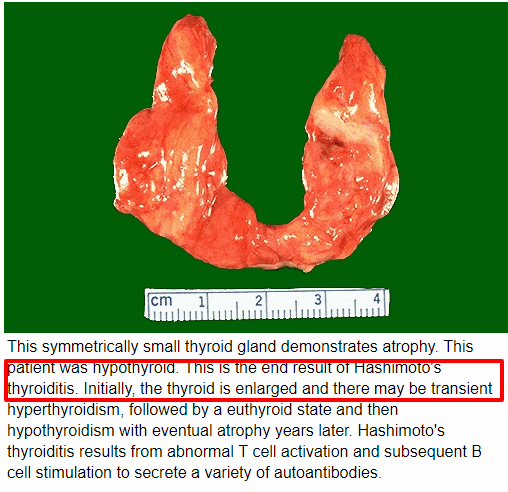 When this process happens in your thyroid it will ultimately lead to the complete destruction of your thyroid gland. This process can take years (sometimes decades) but if it is left untreated then it will definitely destroy your thyroid gland. And because thyroid hormone is required in order for you to live, if you let this happen you will HAVE to take thyroid medication by mouth for the rest of your life. The main problem with treating Hashimoto's is that conventional medicine doesn't have any therapies or medications which target or stop this immune destruction. Because of this, many people want to take matters into their own hands to try and reverse the process on their own. And that's exactly what I want to talk about today. It may seem obvious to you that the end goal of treating any sort of disease would be to cure it, but that's not actually how doctors approach most disease states. It seems strange, but the current thought process when it comes to managing any sort of chronic condition (of which Hashimoto's is definitely one) is to simply manage it. The word cure hardly ever comes to mind for a conventional doctor when thinking of autoimmune disease or practically any other disease for that matter. They may pay lip service to the idea that curing a disease would be ideal, but their actions say something else entirely. And this logic is seen in how conventional Doctors treat Hashimoto's. 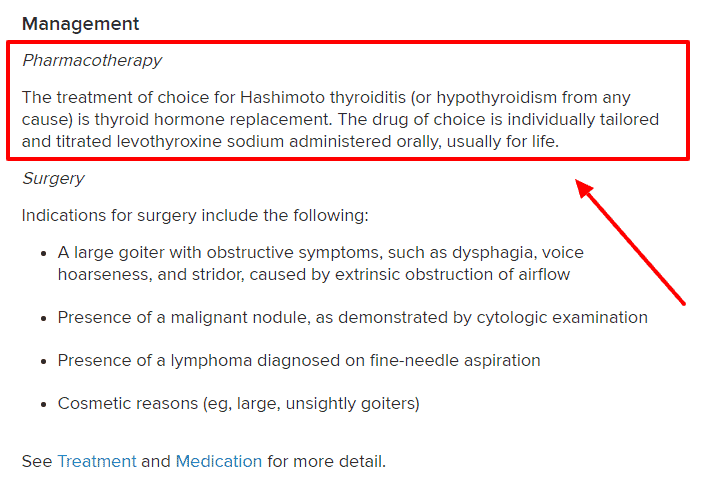 You see, they don't ever really consider Hashimoto's as a treatable entity. Instead, they focus entirely on managing the disease through the use of thyroid hormone medications. The image above highlights the only 2 treatment options available: pharmacotherapy (medication) or surgery (source: emedicine). This isn't a necessarily poor approach to management, but as the patient, you should be aware that curing your disease is nowhere on your doctor's radar. It has to do with the current thought process behind treating autoimmune diseases. The prevailing thought is that these diseases are absolutely not curable but that they can be managed by reducing the immune attack on the body. This is usually accomplished by using immune blocking medications such as steroids, monoclonal antibodies, and other techniques (4). But these therapies do not work for Hashimoto's. So, instead of recommending pharmaceutical medications to treat the condition, your doctor will most likely take a 'wait and see' approach. Your doctors will literally wait until your own body destroys enough of your thyroid gland to warrant the use of thyroid replacement medications. This will never be explicitly stated by your Doctor, but this is absolutely what they are doing. Now again, I'm not saying that this is a necessarily bad approach because not all patients with Hashimotos' can be treated or cured. But if you are a Hashimoto's patient, doesn't it make sense to at least try some natural therapies such as changing your diet, taking some supplements, and improving your lifestyle? What is the downside to these major therapies? There is pretty much no risk and potentially a great reward. This is why so many patients tend to look for Doctors who think 'outside of the box'. Patients are desperate to try any therapy to try and improve their overall condition because it can be very debilitating to have thyroid disease that is left untreated. But this has lead to a number of issues as well! Many doctors have noticed this trend and have attempted to capitalize on the fact that patients are searching for a cure by claiming they have inside information or special therapies that don't exist elsewhere. And this is exactly why conventional doctors tend to be distrusting of the integrative medicine crowd, to begin with. 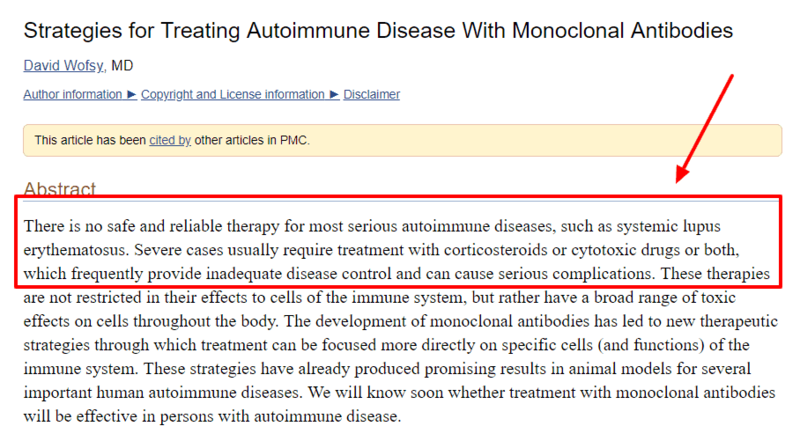 If anyone can write a blog post and exclaim that they know the 'secret' to treat autoimmune disease or Hashimoto's, then what is to stop them? Because of this, there are many providers and practitioners that claim to have therapies that may seem too good to be true. But just because this does exist (and it absolutely does), doesn't mean you should be distrusting of all integrative doctors. In fact, the best type of doctors are ones that have one foot planted in conventional medicine and science and the other planted in the world of integrative therapies. Practitioners that tend to swing to one side or the other tend to miss the bigger picture. A picture where eastern and western medicine can live together without taking away from the other. You should be aware of these differences, especially if you are considering alternative treatments or therapies. My general recommendation is that it's perfectly fine to look at natural therapies, but you should stay away from natural therapies that are incredibly expensive, that sound too good to be true, or that may be risky from a health perspective. You may want to be cautious about going to providers who can't prescribe medications because they will focus solely on natural therapies and may misunderstand the beneficial aspects of conventional medicine. Natural Therapies vs Pharmaceutical Therapies - Do They Work? So, with this in mind, how likely is it that natural therapies will work? We've already established that conventional therapies don't actually target the underlying cause of Hashimoto's, but what about natural therapies? The answer is that they have the potential to work but they may not work in every individual. Because the cause or trigger of Hashimoto's is different for each individual (5). In addition, the severity of the disease also varies from person to person! If we looked at 100 people and put them in a line and subjected them to the same stressor we would find that some of these people would come out without any problems, some with trigger Hashimoto's, some would trigger other autoimmune diseases, some would gain weight, some would lose weight, and so on. How can the same trigger cause so many different reactions? Because each of us is genetically unique. This makes it almost impossible to find the "one" therapy that will treat any given condition and this is especially true for Hashimoto's. The bad news is that it is obviously difficult to treat the condition. But the good news is that natural therapies still have the potential to work for many people. The key to getting them to work is by addressing the main issues in YOUR body. And finding those issues takes time, testing, some luck, patience, and a good provider to help you out (usually a doctor). 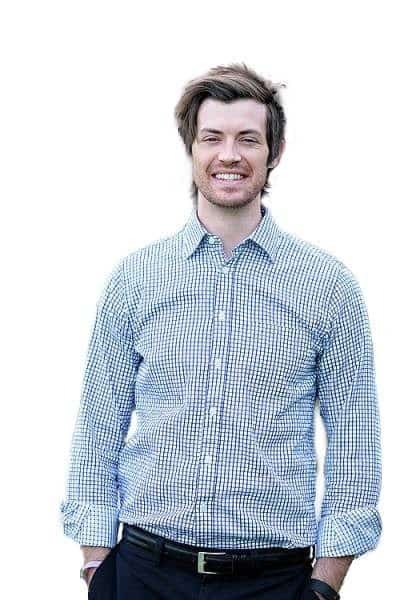 I've had the unique opportunity to treat hundreds of patients with Hashimoto's and I want to share that experience with you today. My experience tells me that while Hashimoto's is definitely a manageable condition, the chance of completely reversing your condition (or curing it) is actually quite small. I would put that percentage at around 10% or less based on the numbers that I have seen. Some people may claim that the number of patients who can be reversed is 100% and I agree with that number in theory, but in practice, it is much more difficult. The main problem, as I see it, in treating Hashimoto's is that it's very difficult to find the absolute trigger of the disease. In addition, even if that trigger is found and treated, it doesn't necessarily mean that the condition can still be reversed. I've found that a number of patients often find that they have Hashimoto's after an extremely stressful event such as the death of a loved one. It's obviously impossible to go back in time and reverse this stress, but is it possible to manage existing and future stress? The answer is yes, but even in doing this it doesn't mean that your condition will be reversible. It appears that, in some individuals, once Hashimoto's has been "triggered", there are probably certain and specific genetic changes that occur which allow for both the emergence and persistence of the disease. In case you are wondering, the 10% number I am referencing above comes from my own experience. Even while using all of these therapies (and more), I just don't see the complete reversal in many patients. I do, however, see a major improvement in almost every single person that I treat. And this improvement can vary from minor (20-30% from baseline) all the way up to major (80-90% from baseline). But it is very difficult to get someone back to 100% without the use of thyroid medications in most cases. I only bring these numbers up to try and help you be realistic about your future and the goal in treating your disease. Of course, your goal should always be to completely and 100% reverse your condition but don't be upset if you can only get to 70% of normal (because even that is great!). The main takeaway I want to leave you with is the fact that Hashimoto's thyroiditis is a potentially reversible condition. If you have been diagnosed with this condition then you owe it to yourself to look at all of the options available to you and at least consider using natural therapies. Even if you don't see major improvement, there is a high chance that you will see improvement of some sort and that will make it worth it. If you opt to try out natural therapies then you want to be sure that you stay clear of therapies with promises that sound too good to be true, stay away from providers who want thousands of dollars up front, stay away from therapies which are not proven to be effective, and from therapies which are potentially dangerous. If you stick to these recommendations then you should be able to navigate the integrative world without damaging your health and your bank account. If you are currently looking for a Doctor then I would recommend that you take a look at this resource which I've created. I'm not accepting patients at this time, but that resource can help you find doctors who share a similar methodology as me. 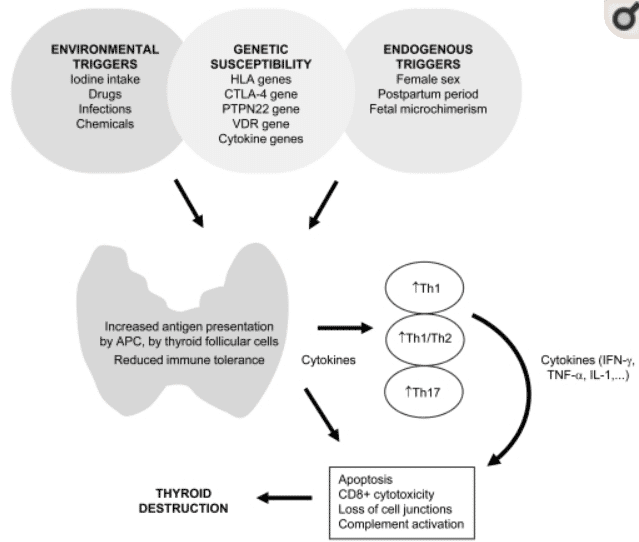 Do you currently have Hashimoto's thyroiditis? Are you looking at natural therapies right now? Have you tried them? If so, what kind of improvement have you seen? Have you been able to reverse your condition? Why or why not?